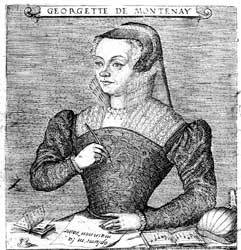 Georgette de Montenays work occupies a particularly important position in the history of emblems: firstly, of course, it was written by a woman, and secondly that woman was a member of the Reformed (Calvinist) faith. Indeed Montenay claims that her book gives us the first Christian emblems (...je croy estre premier chrestiens). This claim needs to be taken in the context of Montenays position among Protestants, who at this period, had undergone some kind of personal conversion, Renez par lEvangile. Earlier emblematic works are of course also Christian, often very overtly so, if not in quite the same way (e.g. Claude Paradins Devises heroiques (Lyons:, 1551; 1557). Nevertheless, Montenays Emblemes mark the beginning of the systematic exploitation of emblems for religious propaganda. It is also the first emblem book to use incised engravings (by Pierre Woeiriot) rather than woodcuts for the picturae. It is distinctive for the way in which it calls on the reader to recognise and often complete biblical allusions, both verbal and visual. We reproduce here the second edition of 1584, which includes an anonymous Latin version, and which was reissued in 1602 in Heidelberg. It used to be argued that Montenay was a lady-in-waiting to Jeanne dAlbret, the Protestant Queen of Navarre. It now seems more likely that her links with the court of Navarre were probably not so close, although the emblems are dedicated to Jeanne dAlbret. Some details of her life need to be reexamined in the light of the redating of her emblems, but the basis has been established in the insufficiently known work of Elisabeth and Jean-Philippe Labrousse (see Bibliography below). It is particularly interesting that this figure who is renowned for her position as a Calvinist was married to Guyon de Gout who remained a Catholic throughout his life. Until recently it was believed that Montenays work was first printed in 1571; however, a copy in the Royal Library in Copenhagen attests to the fact that it in fact first appeared in 1567 and had been in the hands of her publisher, Philippe de Castellas since 1561. Maybe the edition was withdrawn for understandable political reasons and reissued in 1571 when the position of Protestants improved. In the 1584 edition reproduced here, a Latin version was added to the French original and indeed, being placed directly beneath the pictura, given the dominant position. A further edition follows in 1619 in Frankfurt in which, although French resumes its position beneath the pictura, a second Latin version is added, as well as versions in Spanish, Italian, German, English and Dutch (a different version from that by Anna Roemers Visscher found in the 1584 copy reproduced here). This editions is found with title pages in all these languages apart from Dutch. Notable is the fact that the same engravings are used in the three editions, so the plates must have been transported first from Lyons to Zurich and subsequently to Frankfurt. The 1567/1571 edition is reissued in La Rochelle, a notable Protestant centre, in 1620. One of the distinctive elements of of the first edition of this work is the fact that the motto or title was in Latin, despite the vernacular subscriptio. This motto, moveroever, is included in the engraving. Many though not all of the mottoes are quotations from the Bible, and often this is taken from the Vulgate version with which Montenay was doubtless familiar from her youth. It is clearly expected that the reader will be familiar with these quotations and indeed be able to complete them and/or put them in context. Moreover, the engravings by the well-known engraver Pierre Woeiriot are more complex than most woodcuts and add a further layer of allusion. In the 1584 edition, the new Latin subscriptio is made to dominate by being placed beneath the pictura on the recto, whereas the original French appears on the facing verso. GUL: SM772: i3v-i4r. Actual page height: 199mm. The Latin text found in the 1584 edition tends to recreate the same general impression as Montenays original. The tone however is often more rhetorical, with a clearer structure fitting the two couplets. This version and the 1619 edition with s second Latin version and other languages not only allow the work to circulate more widely but also testify to the way in which Montenay was read in the 16th and early 17th centuries. Attempts have been made, notably by Regine Reynolds-Cornell, to set the emblems in a context of precise historical reference, but this needs to be reconsidered in the light of the considerably earlier dating we now have to adopt. Several emblems in the copy reproduced here include highly calligraphed Dutch translations by the major poet Anna Roemers Visscher. These have not been transcribed or indexed. Montenay, Georgette de, Emblemes ou devises chrestiennes (1571), ed. Christopher N. Smith (Menston: Scolar Press, 1973). Facsimile reprint. Adams, Alison, Les emblemes ou devises chrestiennes de Georgette de Montenay: édition de 1567, BHR 62 (2000), 637-639. Adams, Alison, Georgette de Montenays Emblemes ou devises chrestiennes, 1567: New Dating, New Context, BHR, 63 (2001), 567-574. Adams, Alison, Webs of Allusion: French Protestant Emblem Books of the Sixteenth Century (Geneva: Droz, 2003), especially pp. 9-118, and for further bibliographical information. Reynolds-Cornell, Regine, Witnessing an Era: Georgette de Montenay and the Emblemes ou Devises Chrestiennes (Birmingham, AL: Summa Publications, 1987). Paulette Choné, Emblèmes et pensées symboliques en Lorraine (1525-1633) (Paris: Klincksieck, 1991), pp. 543-660.